I’ve installed Pureple. Now what? Awesome!! Now you can start building your digital closet by adding your own clothes, shoes, accessories, makeup etc. Do not forget to check the main menu on top left. In main menu, you will find options to create outfits, have Pureple suggest outfits for you, add outfits to Pureple calendar, check statistics on your wardrobe, make packing lists and check out Community to see inspiring looks. How can I add my own clothes to Pureple? You could add your own clothes & shoes & accessories & makeup & hairstyles etc. using the Add button on title bar. It gives four options to add an item: From our Wizard, web, by taking a photo or using existing ones from your photo library. Although it takes a bit of getting used to, we recommend adding from wizard and web in the long run. Tap on ‘Wizard’. you will see a list of wardrobe staples. Tap on the ones that you have to select them. Tap ‘Done’ when you are done to easily add them to your wardobe. This will search for the item you are looking for. Next, you’ll be presented the ‘crop’ screen. Adjust the image frame to crop if you’d like to. You can skip this step is no cropping is needed. Next, you’ll be presented the ‘erase background’ screen. Adjust the sliding bar to erase the background. You can skip this step, too. The item is added to your wardrobe. Tap on another item and repeat from step 6 or go back to search for another item using the ‘<‘ back button. Tip: How to pick the best quality photo of my item? 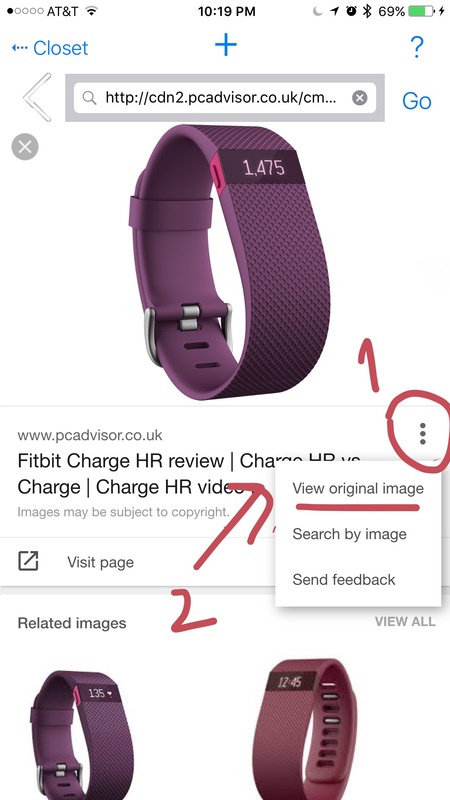 How to add an item that appear way in the bottom of search results? The item is added to your wardrobe. Now you can set the category of the item and fill in other details you’d like to add. When you are on the ‘Wardrobe’ view, tap on ‘Add’ in the title bar. Then tap on ‘Photo Library’. Select the photo(s) you’d like to add. Then tap ‘Done’. Next, you’ll be asked if you’d like to add them under a specific category or under ‘Not Categorized’. The items are now added to your wardrobe. Now you can set the properties e.g. season, occasion, color, brand, size and if added as ‘Not Categorized’, the category of the items. Laying the garment on the ground works better for heavy fabrics. Hanging on a wall works better for light fabrics. If laying on the ground, a hard (smooth) surface reduces shadows and produces better results. Hardwood floors, light color carpet, thick paper, mats are few ideas to try. If hanging, we use a clear pin used on cork boards on a light colored wall. And pick the wall that gets the best light. Using a clear plastic hanger such as the ones used in stores or a wood hanger makes hanger less noticeable. Pick a hanger properly sized and stick to the same hanger for consistency. Using the same background on all photos will help when they are used in an outfit together. If the background color is fairly different than the item’s own colors, background eraser does a better job erasing it. Especially for dark colored items on light color background. Last but maybe most important, taking the photo in daylight, in a well lit room. It makes a huge difference. Nothing beats the quality of a professionally taken photo, under best lighting and potentially Photoshopped. So please consider adding from web. How can I delete an item? Tap and open an item you’d like to delete. This should take you to the item details page. Scroll down under the image till you see ‘Delete’. Tap on the checkbox on top left corner of an item to select it. You can select multiple items. Along with a check mark on the selected item, you will also see a blueish ‘settings icon’ that appears towards the bottom of the screen. Tap on the setting icon and you’ll be presented with options e.g. ‘Delete’ or ‘Categorize’. Tap on ‘Delete’ in order to delete the selected items. How can I set or change the category of an item? Categories are generally intended to describe the function of an item. It can be high level e.g. ‘Top’, ‘Bottom’, ‘Shoes’ or can be more specific e.g. ‘Sandals’, ‘Pumps’, Sneakers’. Pureple comes with the most common fundamental categories defined. You can add your own categories (as many as you need) to suit your needs. You can also delete any category that you do not need. Tap and open an item you’d like to categorize. This should take you to the item details page. Scroll down under the image till you see ‘Categories’. Tap on ‘Categories’ and select the applicable categories for the item. Along with a check mark on the selected item, you will also see a blueish ‘settings icon’ that appears towards the bottom of the screen. Tap on the setting icon and you’ll be presented with options e.g. ‘Delete’ or Set ‘Category’, ‘Brand’ etc. Tap on ‘Category’ and select the applicable categories for the items you’ve picked. If the category for the item is missing from the default list, you can add it by tapping on ‘Add’ at the bottom of the list. Please see ‘How to add a custom category’ below for details. You can also delete unwanted category names here by tapping ‘Delete’ and then selecting category name to be deleted. While categories are intended mainly for ‘function’, there is no restriction if you’d like to use them for a custom reason e.g. wishlist, inspiration, … to make it work for you. How can I add a custom category e.g. for Sweaters? Type the category name e.g. Sweaters and tap on Add. The category is added now and you return to the item details view. You’ll now see the category you’ve just added in the list. You can start using the newly added category just like the other categories.You can add as many category as you like.